When it comes to kitchen renovations, our approach tends to be somewhat different than when we redecorate our living rooms and bedrooms. Our cooking space should not only withstand constant foot traffic from hungry inhabitants, but it also needs to handle whatever gets thrown its way (like spaghetti, for example). 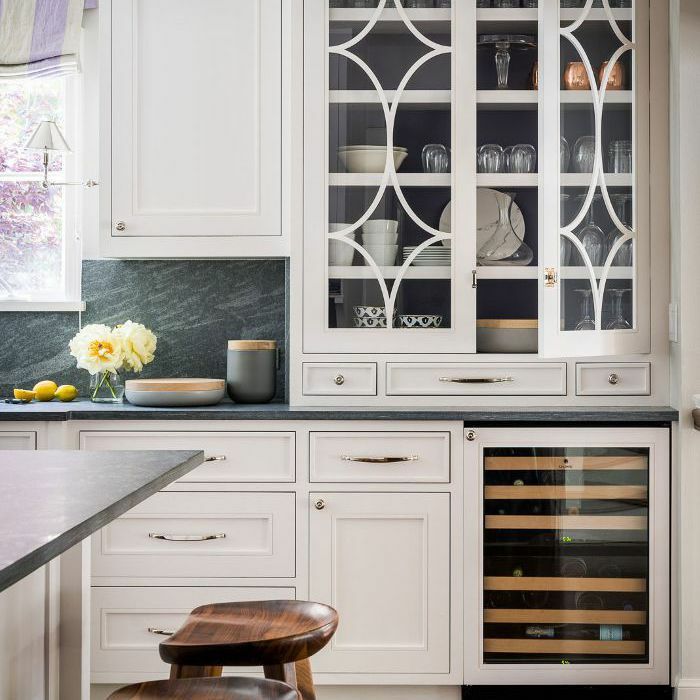 Elements like cabinetry colors, countertop materials, and hardware are only a few things to keep in mind when redesigning our culinary corner—we also need to consider our kitchen backsplash tile as part of the big picture. To guide us through the kitchen reno process, we tapped five interior designers to weigh in on the backsplash tiling styles that's cooling off and what to invest in instead. While not everyone agrees on the tile material that's been overdone (hint: it's a classic one), there was a clear consensus that craftsmanship should be the top focus when looking for investment-worthy materials. Up ahead, see what interior designers Melanie Burstin, Cathy Bailey of Heath Ceramics, Edyta Czajkowska, Jade Joyner of Metal + Petal, and Alison Pickart have to say about kitchen backsplash tiles we should put our money towards and why. "I think geometric cement tile backsplashes are beginning to feel dated," explains Los Angeles-based interior designer Melanie Burstin. "They came into popularity to provide a fun pop of pattern and boldness, but now they're starting to be repetitive." Instead, invest in: Handmade and organic materials. According to Burstin, a "subtle yet exciting" alternative to cement are handmade and organic backsplash tiles. "With handmade tiles there's variation with each piece, therefore creating a depth that's often missing with a more unified look. If the tile looks like it was handmade in the back of a chateau in France, it should work well." However, the minimalist-focused designer is "also a firm believer that there is nothing more timeless than a white subway tile. If that feels too safe, an easy solution is to change the tile size to be a little smaller or a little longer than a standard subway. Taking the color from a bright white to a cream or an off-white is another way to slightly adjust this classic backsplash." Ditch: Trendy patterns or colors. "I would think twice about installing anything that is in a super trendy color or pattern," says Illinois-based interior designer Edyta Czajkowska. "However, if it is something you truly, truly love, then I say go for it. After all, our homes are meant to reflect our personal style, not anyone else's." "A beautiful marble counter and backsplash is a classic look that will stand the test of time," suggests Czajkowska. "It lends itself to so many different styles ranging from ultra-modern to traditional." "Standards have always had this itty-bitty splash dimension on the walls above counters," says San Francisco-based interior designer Alison Pickart. This year, it's time to break the rules of the four-inch backsplash, she says. Instead, invest in: Enough tile to reach the ceiling. "Whatever your material choice is for the backsplash, be it slab or tile, take it all the way to the bottom of your upper cabinets. If no upper cabinets; a minimum of 18 inches of splash should be operating procedure. If you're feeling spendy, take the splash all the way to the ceiling. It will look luxurious and make the room feel taller." What to ditch: Subway tiles. "While subway tile is a classic, the farm look made famous by [home design TV shows] has worn it out," says Jade Joyner of Metal + Petal. "Stay clear of the typical, the boring, the subtle, and instead choose color, pattern, print, or texture. Don't just go to the nearest hardware store and pick something up." Instead, invest in: Unique, artisan-made finds. "Subway tiles can create a classic timeless look, but they've become a bit of a commodity," says Cathy Bailey, who's the co-owner and creative director of Heath Ceramics. Instead, invest in: Out-of-the-box shapes and textures. For her own kitchen, Bailey used a three-inch hex tile in a layered glaze that looks as stunning up close as it does from the next room over. "Hex tiles paired with an interesting glaze to create character and textures and I think a medium scale hex tile is a unique alternative," explains Bailey. "Like subway tile, the overall design does not overwhelm the kitchen's design. Overall the combination creates a kitchen backsplash with much more depth, character, and detail than standard subway tile. The glaze quality also expresses the craftsmanship of the installation." Up next: Now that you've honed in on your favorite backsplash tile style, find out the top kitchen color trends of 2019.